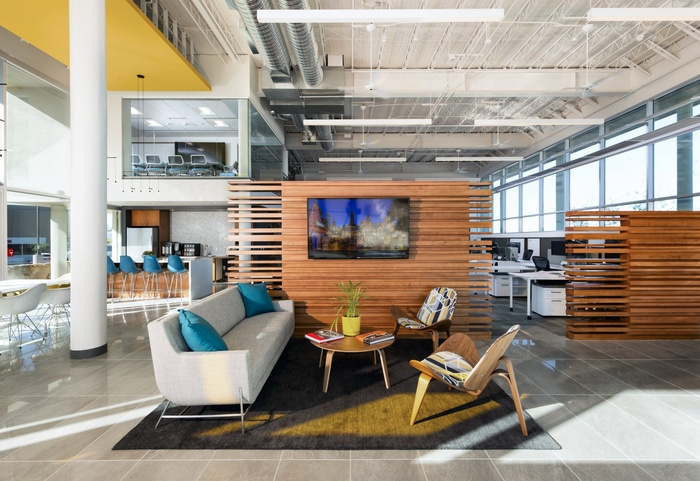 Cuningham Group Architecture designed their new offices in the spring of this year, located in Phoenix, Arizona. Cuningham Group leased and restored the historic Farmers & Stockmens Bank building and made the Mid-Century Modern landmark its new Phoenix office. The building, at 5001 E. Washington Street was designed by the internationally famous architectural team of Pereira & Luckman in 1951. It is certified a historic structure by the City of Phoenix Historic Preservation Office. Cuningham Group completed interior renovations this year. Another dramatic feature is the “donut-shaped” bank vault – seen as the distinctive, round, stone-clad wall on the exterior.